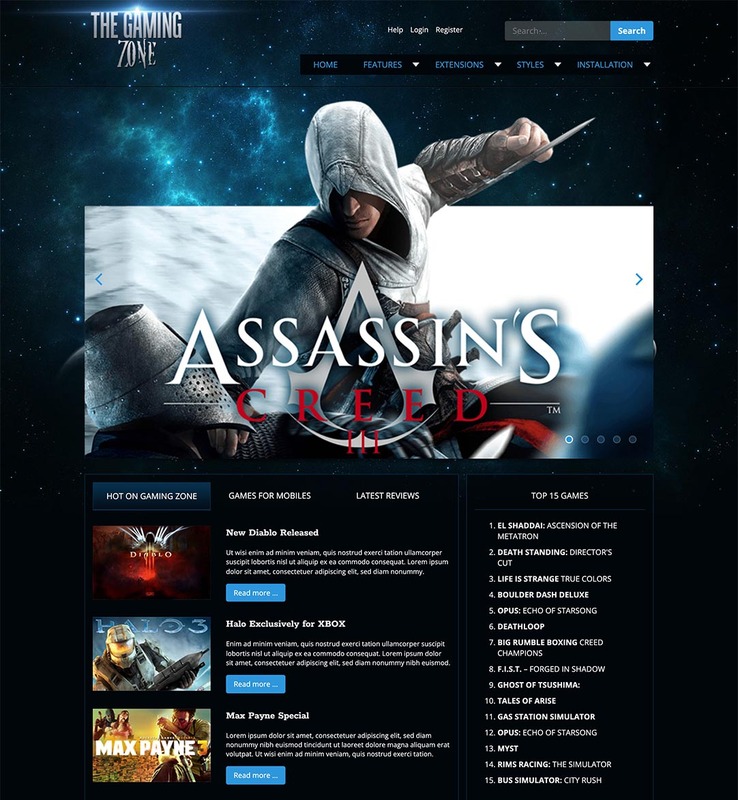 Gaming website template - Hot Gaming Zone can help you to create your own website about video games. On this site, you can publish video game reviews, walkthroughs and other stuff related to this industry. Our first steps into the magical world of computers are usually made because of some breathtaking video games. Nowadays, the industry of video games is as valuable as the movie industry. Many predictions say it would be even more valuable in the future. In ninety's, we used to play games in the entertainment saloons. Later, video games became available in our homes on the first 8-bit and 16-bit computers and consoles. Modern video games are more than just games. They are simulation of lives that we maybe liked to live, but we couldn't. We can be pilots of Boeing 747. We can drive a super modern car over 200 miles per hour. We can play football against Messi or be a secret agent or a war veteran. Everything is possible in the modern video games and that's probably the answer of the question: Why they became so popular? Unfortunately, we can't live from playing video games. That's a shame, really! :) If we can't just play games, we can make a site about games using our gaming website template and write about games (in pauses of playing). If you have enough readers, such web site could bring a good extra income. Several pre-defined styles with different main color. Each color is easily customizable in parameters. Infinite color combination. Hot Responsive Slideshow, Hot Joomla Carousel PRO and Hot Joomla Gallery modules included with template, pre-installed and configured. Support for K2 component is included. Commercial modules included in template are free for you, if you buy template. 16 collapsible module positions. You can add more within Sparky Framework.